Pan-fried pork chops make for a juicy, filling meal you can cook up in minutes. Thick cuts require a bit more care and attention so you don't scorch the outside and dry out the meat near the surface before the pork safely cooks through all the way. Although you need to be continuously involved, it's not a difficult process, and certainly one even novice home cooks can get the hang of after a few times. 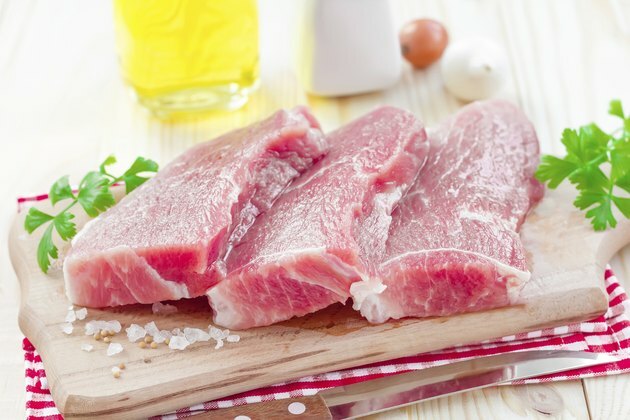 Because pork is classified as a red meat and can run high in saturated fat and cholesterol, choose lean cuts and use heart-healthy unsaturated cooking fats. Remove the pork chops from the refrigerator 1 to 2 hours ahead of time -- just don't keep meat out at room temperature for longer than 2 hours. Chops cook faster and more evenly if they're not cold when they go into the pan. This is particularly important for thick-cut meat. Season the pork with salt, pepper and any additional herbs or spices you want to use. Thyme, rosemary, tarragon, sage and basil are all good picks. Heat a large cast-iron or other heavy-bottomed skillet over medium-high heat. Heavier, higher-quality pans distribute heat more evenly, which is particularly beneficial when dealing with thick cuts of meat. Heat the pan until drops of water instantly sizzle and evaporate, then add a coating of canola, peanut or other unsaturated fat-based oil; cover the bottom of the pan completely, but don't get carried away, because even heart-healthy oils add lots of calories. Place the pork chops in the skillet without crowding them; if necessary, fry in batches. Leave them in place for 3 minutes, until the bottoms richly brown and the sides of the chops change color about 1/4 the way up. Turn the pork chops over with tongs. Reduce the burner heat to medium-low and leave the pork chops in place while the second side sears. Spoon oil from the bottom of the pan over the top of the chops to keep them cooking from the top and the sides as it drips down. Flip the chops again after 3 minutes, then continue to turn the pork every 20 to 30 seconds. Continue to spoon pan juices over the top in between flips. Remove the pork chops from the pan once they reach an internal temperature of 145 degrees Fahrenheit at center. Use an instant-read meat thermometer to know when they're done. Depending on the thickness and whether the chops are on or off the bone -- bone-in cuts cook a little more quickly -- they should take approximately 10 to 12 minutes. Let the meat rest for 5 to 10 minutes prior to serving. Keep fresh pork below 40 F and use or freeze it within 3 to 5 days. When using an instant-read thermometer, make sure it doesn't come into contact with any bone in your cut of meat, as this throws off the reading. Wash your hands with soap and water after handling uncooked pork to prevent the spread of bacterial and foodborne illnesses. Also sanitize all surfaces and cooking tools that made contact with the raw meat.